An event you'll fall in love with! 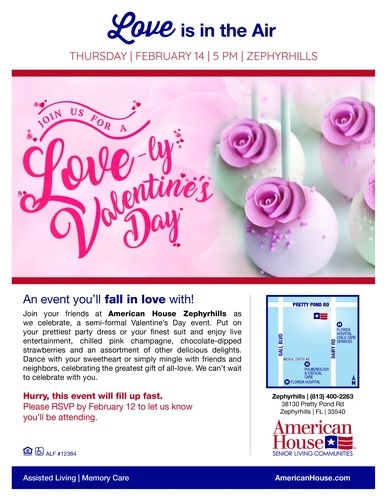 Join your friends at American House Zephyrhills as we celebrate, a semi - formal Valentine's Day event. Put on your prettiest party dress or your finest suit and enjoy live entertainment, chilled pink champagne, chocolate-dipped strwaberries and an assortment of other deliciuos delights. Dance with your sweetheart or simply mingle with freinds and neighbors, celebrating the greatest gift of all-love.